This week the UK Commission for Employment and Skills and Universities UK launch a joint report, Forging Futures: Building higher level skills through university and employer collaboration, on how universities are working with employers to develop bespoke and innovative pathways to high level skills. The report demonstrates the strength and diversity of this collaboration. There are benefits to employers and universities, but most importantly, however, it shows how this is enhancing people’s lives and prospects by developing talented people, new career opportunities and creating new jobs. A new cooperative ‘norm’ is emerging. This work comes at a crucial time. The recent OCED Education at a Glance figures show that the UK is doing well in terms of the proportion of people with high level qualifications, but raises concerns about employment outcomes. We also have problems of skills mismatch in the UK, as has been highlighted by UKCES. There is growth in demand for high level skills, but along-side this is concern that current employees’ skills are not being utilised effectively. The type of collaboration seen in this report is going to be crucial to addressing these problems. Universities and employers recognise this and are already stepping up to the challenge. In leading this work for Universities UK and UKCES I have been struck by the ubiquitous and diverse nature of this collaboration and how it builds on and compliments the world class excellence we see across the UK higher education sector. For example, the report shows how the University of Bradford is working with schools and employers in the region to provide skilled people that map against the needs of fast growing environmental sector. Another example is the Advanced Manufacturing Research Centre and the University of Sheffield, working with companies from across the region to meet their skills needs, drawing on its position of manufacturing research excellence. These are very different sectors, universities and collaborations, but they are driven by common motivations and underpinned by excellence. Another strong message from this work is the level of strategic commitment by both employers and universities. This is not a marginal activity and it is not being foisted upon them. For many universities this fits with their social and economic missions, commitment to high quality provision and positions them well in a changing higher education environment. For employers, collaboration such as this makes clear business sense, increasing their economic performance through matching skills with needs in the workplace and ensuring they have a sustainable pipeline of potential recruits. The appetite to do more is strong, so as well as showcasing what is currently happening the report draws on the cases examined to provide advice on the set up delivery and sustainability of these collaboration. At the recent Universities UK conference Toni Pearce, President of the NUS, called on vice-chancellors to take up the challenge of creating more diverse and vocational routes into higher education. This echos increasing interest in this from across the political spectrum as the country’s skills challenges come more sharply into focus. This report is therefore a call to action. Building on our own collaboration between Universities UK and UKCES we are committed to promoting it with universities and employers and providing support necessary for developing future collaboration. There is much going on but we could all benefit from more. Excellence, diversity and innovation can combine within the sector to keep our world class system at the forefront. This week we will be highlighting the difference collaboration can make, and the benefits it can bring. 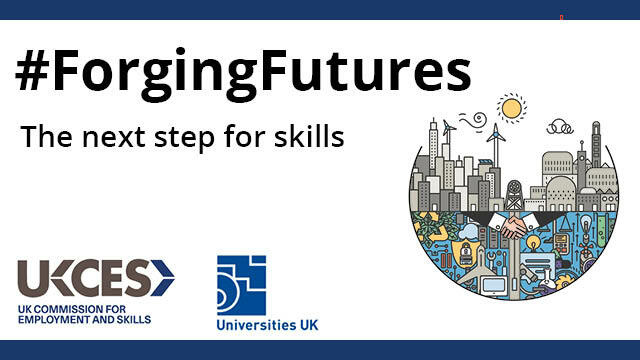 Join the conversation by using #ForgingFutures on Twitter, or following @UKCES. Looking at London: clumps in the vacuum cleaner? Hunting for treasure: How can universities and employers work together to regenerate an area?